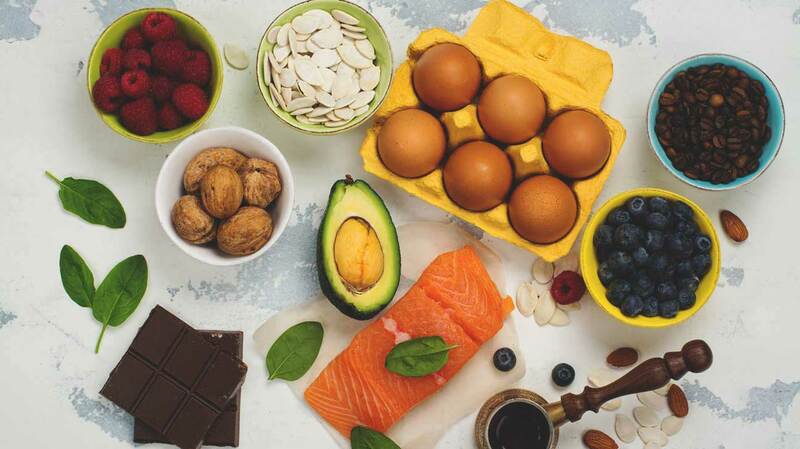 You’ve probably heard about the low carb, high fat diet that’s so popular because of claims that it causes extreme fat loss. I have done a significant amount of research to determine if this style of eating really is effective. I have found that it totally can be if your body reacts well to high fats and minimal carbs. Mine for instance, does not. I exercise at a fairly intense level, and I feel my workouts suffer if I deplete the glycogen stores in my muscle. The reasoning and science behind the keto diet is solid and true, but with anything I prescribe to my clients, it needs to be lifestyle oriented and enjoyable. So what really is Ketosis? This style of eating is popular with good reason: low carb diets offer proper nourishment with whole foods, while keeping your body burning fat for fuel. This is a great way to be, as it makes fat loss largely effortless! But where does this “ketogenic” word fit into the picture? Well, ketogenic comes from the word “ketosis“, which is a state in which your body breaks down fat molecules into ketones to provide energy. This state is achieved through very low carbohydrate intake and higher than normal fat intake. The “normal” state of the body’s metabolism is called “glycolysis”, where carbs are burnt for energy. The long and short is that when your body is in carb-burning mode, it will use all available carbs for energy before it touches stored fat. In ketosis, your body is primed to burn fat, and this is great news for anyone trying to get lean. Ketosis takes some time to get into; about two weeks of low carb eating is required for the initial adaptation. During this time there will be bouts of sluggishness, fatigue, headaches, and some gastrointestinal issues as you adapt, often referred to as “keto flu“. Make sure to step up your electrolyte intake to reduce more of these issues. In addition, the “diet” aspect of this ketogenic diet plan (the caloric restriction) shouldn’t be worried about. Weight loss will come as your body regulates appetite as it the addiction to sugar and processed food lessens, so restricting calories during the initial two weeks isn’t recommended. I lost a bunch at first, but now it’s slowed? It’s water! And some fat of course. Ketogenic diets often create a significant loss of water during the first phases. This is because carbs are converted to glycogen in your body, which is stored in water within the muscles and liver. As you deplete stored glycogen, your body flushes this water out. This is a huge part of the initial weight loss during the first few weeks of ketosis. While rapid fat loss does occur at first, a lot of water weight is often dropped as well, but this is a great encouragement as it often results in both weight loss and less bloating, allowing clothes to fit better. If you’re curious, I say absolutely! Know that the first couple of weeks will be unpleasant, but then it should get better. For me, I suffered from the “keto flu” for a month before I gave up. My intense exercise regimen just wasn’t conducive to this style of eating. Give it 3 weeks and then make a decision. The food you eat is great! Bacon, steak, peanut butter, avocados, cheese, eggs…doesn’t sound too bad, does it? I found this to be a great resource for food to include in your keto diet!